One of the strangest investment vehicles ever designed is something called the Bitcoin, which is at once an exciting new technology for managing online transactions and an alternative currency to national currencies like the dollar, yen and euro. Last week, people who owned bitcoins discovered that electronic “coins” worth $1,350 were suddenly worth just under $945. Around the same time, U.S. regulators rejected an effort to create a bitcoin exchange-traded fund (ETF). 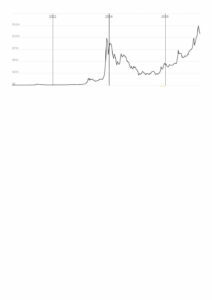 You can see from the chart of bitcoin prices since inception that this is not an “investment” for the faint-hearted, and there is some question whether the currency has a future outside of the small network of miners and shady dealers. If you’re approached to invest in bitcoins, check first to see if anybody you want to buy from is willing to accept this alternative currency.